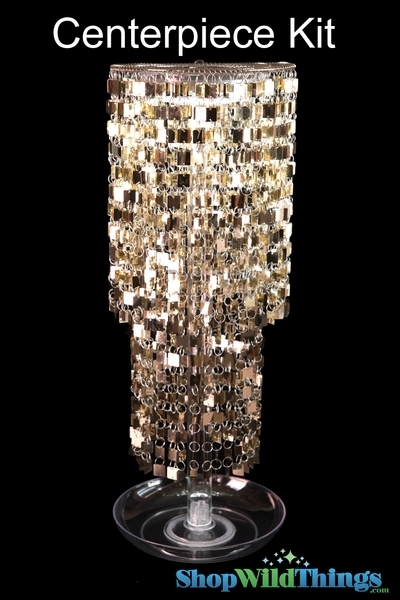 1) Shimmy Chandelier Metallic Soft Gold: Welcome to the chandelier Decoration of your dreams! 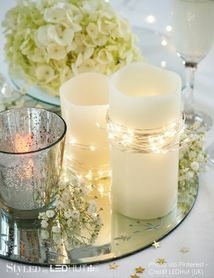 This beautiful mirror-like Decoration will LIGHT UP YOUR event, home, room, office.....it's so fantastic and bright! 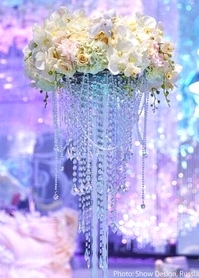 This Decoration is 2-Tiered and is 19" in length overall. The overall diameter is 8.5". Strand length outside tier: 19", 8.5" diameter and has 45 strands! The strand length for the inside tier is 12" and has 35 strands. That's a total of 80 strands!!! Each shimmering square mirror is 1/4'. Place this on top of one of our chandelier risers to use on the tabletop! This we are calling a "Chandelier" but it does not come with a light kit. We'd recommend placing our ACOLYTE LED lights suspended on the inside, or topping it with some LED Saucers. 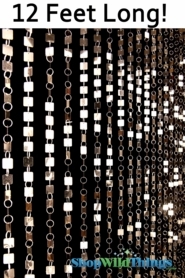 You can EASILY add or subtract length to this chandelier. 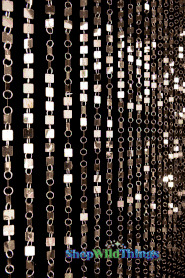 You can purchase our matching "Shimmy" Beaded Curtain and add length to it if you wish! Tons of work went into making this, and it's SO inexpensive! The square mirrors are made of lightweight PVC so it is SO light. This means that not only will it be easy to transport, hang, and take down....but also the slightest breeze will make the strands move and really show sparkle and shine.